According to our sources, the search giant has built Android and iOS versions of an app that automatically authenticate and connect to its free hotspots inside Starbucks stores or wherever they are available. Google is currently trialling the Android app at its Mountain View HQ and has plans to offer an iOS app too. Perhaps more interesting is Engadget’s claim that Google has “specific plans” to roll out more Google WiFi hotspots in the US and Canada as part of the ongoing “Google WiFi” effort it first launched in Mountain View back in 2006. Google may also expand its partnership with Boingo, extending logins to locations where it’s footing the bill for free wireless. Google plans to have its WiFi rolled out at all 7000 Starbucks locations by the end of the year. Boingo Wireless has updated its iPhone, iPad, and iPod touch “WiFi Finder” application with the ability to sign up for WiFi hotspot subscriptions with iTunes credentials. Boingo has over 600,000 WiFi hotspots worldwide, and I typically see Boingo hotspots at airports across the country. Being able to sign up via an iTunes-based subcription will make using a Boingo hotspot easier than ever, so even though Boingo is seemingly giving up a 30% cut to Apple for these new subscriptions, their user base will probably grow due to the easier sign up process. The plan via iTunes is $7.99 per month. 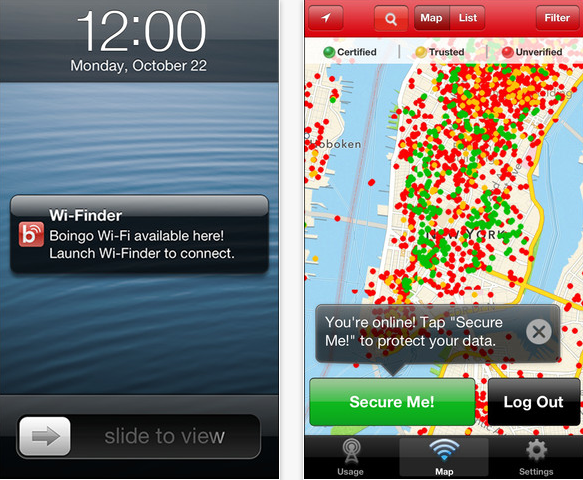 As it has always done, the WiFi Finder app features a data tracker and a VPN service. The app is available for free on the App Store.